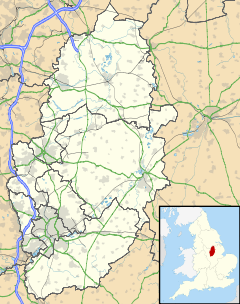 Highbury Vale is an area located in the city of Nottingham, and is located in the Bulwell Forest ward. The area is located roughly 5.4 miles (8.7 km) from the City Centre, and about 1 mile (2 km) from Bulwell. Surrounding areas include Bulwell towards the North, Bestwood to the east, Hempshill Vale to the west and Cinderhill and Basford towards the south. At the 2001 census, the area had a population of 4,530. Most facilities in Highbury Vale are located on Highbury Road. Facilities include several takeaways, a Ladbrokes, a McColls's Convenience Store as well as a pharmacy, a British Red Cross charity shop and other convenience stores. Highbury Vale also has a sports centre located off Kemmel Road as well as a health centre known as Highbury Hospital. Schools in the area include the Heathfield Primary and Nursery School of Kersall Drive, Our Lady of Perpetual Succour Catholic Primary School next to Piccadilly as well as the Cantrell Primary and Nursery School. According to the data of the 2001 Census, the area has a population of 4,530, and a majority of the population are aged 25-44, who make up 32.8% of the population. The census also shows that 87.0% of the population is White British, as well as 1.5% being White Irish and 1.1% being classed as Other White. 3.8% of the population is Mixed Race, 1.8% is Asian or Asian British, 4.5% is Black or Black British as well as 0.2% of the population being Chinese and other ethnic groups also making 0.2% of the population. The 2001 Census shows that 61.3% are Christian as well as 27.5% being Atheist. 1.1% of the population are Muslim, Hinduism and Sikhism each score 0.4%, 0.1% of the population are Buddhist and other religions make up 0.3% of the population as well as another 9.0% who did not state their religion. Highbury Vale has two different main platforms for Line 1 and Line 2, as they both separate after stopping at the preceding station (David Lane). Next to the Hucknall Line platform is the railway line for trains that travel from Nottingham to Worksop. The nearest railway station to Highbury Vale is located in Bulwell. Highbury Vale has a number of frequent bus service ran by Nottingham City Transport as well as a Locallink service ran by Nottingham Community Transport. ^ "Highbury Vale Community Census Profile 2001". Retrieved 4 January 2018. ^ "Tram timetable" (PDF). www.thetram.net. ^ wearebase.com, Base,. "Service 17 on Brown Line". www.nctx.co.uk. ^ wearebase.com, Base,. "Service 68 on Yellow Line". www.nctx.co.uk. ^ wearebase.com, Base,. "Service 68A on Yellow Line". www.nctx.co.uk. ^ wearebase.com, Base,. "Service 69 on Yellow Line". www.nctx.co.uk. ^ wearebase.com, Base,. "Service 69A on Yellow Line". www.nctx.co.uk. ^ wearebase.com, Base,. "Service N68 on Yellow Line". www.nctx.co.uk. ^ wearebase.com, Base,. "Locallink Service L14 ran by Nottingham Community Transport" (PDF). www.ct4n.co.uk.